Address: 4500 W. Tropicana Ave.
Hotel amenities : Concierge, beauty salon, barber shop, laundry service, luggage service, maid service, video arcade, 18-screen movie theatre, 70-lane bowling center, currency exchange, safety deposit box, wake-up call. All the Orleans, Mardi Gras never ends. The Basin Street fade on the front of the hotel is a beacon to fans of New Orleans and the hotel does not fail to please them. The interior of the hotel features giant Mardi Gras masks in the 135,000-square-foot casino offering slots, a 23-table poker room and a race and sports book. The Orleans Showroom hosts live entertainment with the likes of Air Supply and Suzanne Somers. 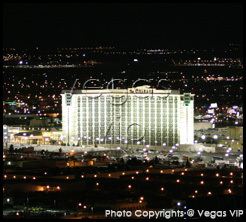 In addition, the Orleans Arena features headliners and is also home to Vegas' minor league hockey team, The Wranglers. 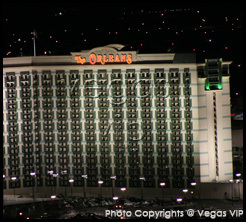 A wide assortment of dining options are available at the Orleans, such as the renowned steaks and prime rib of Canal Street. Also, family entertainment abounds with a youth activity center, state-of-the-art bowling center and giant movie theater complex.